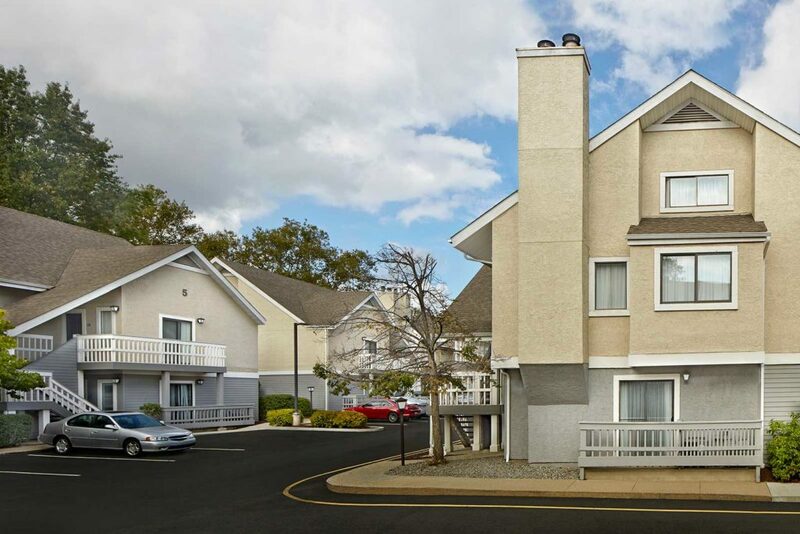 The best hotel option for group travel to New Haven, CT is New Haven Village Suites. Many groups in New Haven have selected our hotel to host their guests for special events including weddings, family reunions, or church events. The value of a full daily hot breakfast buffet, complimentary parking and over-sized suites make it an easy decision. And don’t forget there’s a fully equipped kitchen in every suite! See a full list of our amenities here. The Clubhouse offers a comfortable place to gather for making your weekend plans or to relax and mingle with your family and friends. Also located in the Clubhouse is a private 640 square foot function room, available for rent, to have a small meeting or gathering of friends and family. When you decide to celebrate your wedding day in the New Haven area, consider making New Haven Village Suites your home away from home. Make sure you wake up feeling refreshed and relaxed on your wedding day, and with our spacious suites and luxurious bedding you are guaranteed to do just that! We offer a great value for your guests and make the planning easy for you. To reserve a block of 8 or more rooms, our Sales department is happy to help with all of the arrangements. Please contact the Sales department directly for further information. New Haven Village Suites is the winning choice for sports teams coming to New Haven. The over-sized suites offering pull-out sofa beds and a full kitchen, makes taking the team or the family on the road …easy. Free parking and the hot daily buffet breakfast for the entire family and team… will be the “winning play”. Contact the Sales department and make the planning easy. Set the perfect tone for an extended project in the New Haven area. Selecting the only all-suite hotel in New Haven is a wise choice. New Haven Village Suites offers the largest guest suites with full kitchens. We also offer a variety of complimentary items including daily hot breakfast buffet, complimentary parking, free WiFi, and a light dinner option Monday- Wednesday evenings. We also offer self-serve on-site laundry services or same day dry cleaning services. Our courtyard offers a place to relax in the sun or take advantage of our outdoor grill! The sales department can help make planning easier, please call for further information. Whether attending a conference on campus or a smaller meeting. New Haven Village Suites is the “smart” place to stay. See our Visiting Yale section to get more information about visiting, and making your reservation with our special Yale rate. 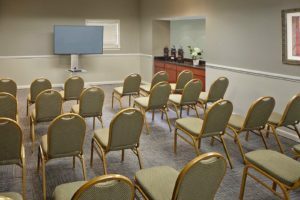 For small meetings & events, the Clubhouse offers a 20′ x 31′, 640 square foot second-floor meeting room. This may be reserved for the day or longer if needed. The room contains 6′ x 8′ tables. Audio/visual equipment is available including high-speed internet access, speaker phone, screen, and flip chart. Catering services are also available upon request. New Haven Village Suites is the perfect location for groups and corporate clients. Our rooms are 50% more spacious than a standard hotel room and include a fully equipped kitchen in all 112 guest suites. We offer complimentary parking and provide a complimentary shuttle within a 3-mile radius, 7 days a week, which includes transportation to and from Tweed Airport, Union Station, Yale University, UNH, Yale Hospital, and Smilow Cancer Center, as well as many other key locations. A complimentary full hot buffet breakfast is served daily — a great start for any group or corporate guest. Complete the form below to start the conversation about hosting your group at our hotel. Sign up for news, deals & more!